At the same time, U.S. oil and natural gas companies are committed to producing energy in an environmentally responsible manner. A leading example is the ongoing work to reduce methane emissions during field operations. Government data shows those efforts are succeeding. The U.S. Energy Information Administration (EIA) says that from 2011 through 2015, U.S. oil production increased 66.7 percent and dry natural gas output grew 18 percent. Yet, even with the added production, methane emissions from oil and natural gas production decreased for the fourth straight year in 2015, EPA reports. [M]ethane emission reduction trends by the industry are now observable despite major increases in the production and use of natural gas. Improved policy measures, removal of bureaucratic barriers, and regulatory certainty are imperative to allow these trends to accelerate and lead to even greater GHG emission reductions, as well as the benefits of reduced air pollutants such as SO2, NO2 and PM. Innovation and technological advancement through the free-market, rather than command and control regulations, have proven to be the solution to environmental questions and should be embraced by regulators and policy makers moving forward. Milito refers to the general need for regulatory flexibility from government entities that oversee industry operations – versus a one-size-fits-all approach that could significantly increase costs without providing commensurate benefit while potentially hindering companies’ ability to supply the country’s energy needs. A better approach is one that acknowledges and builds on the climate and environmental progress that’s being made. Companies are continuing to improve operations to maximize methane recovery. 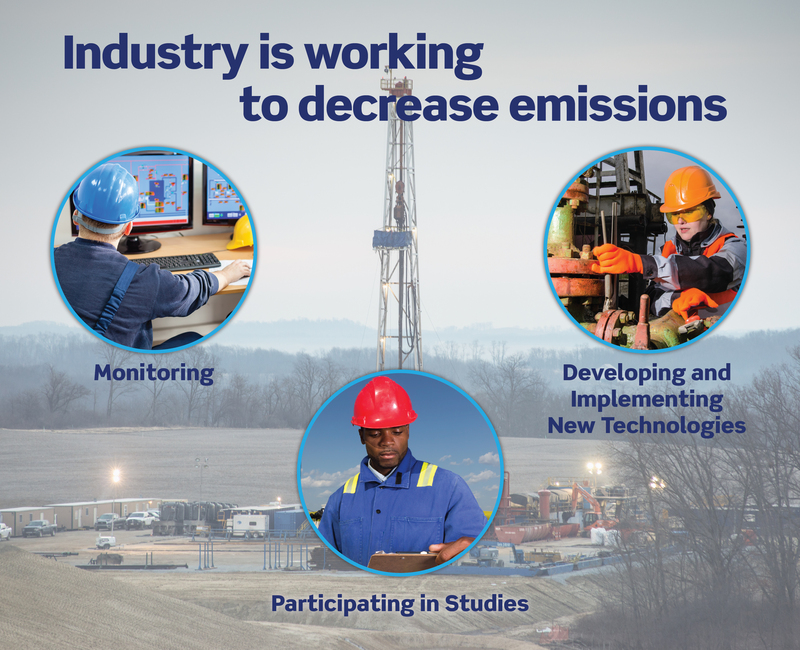 In fact, industry developed innovative technologies to reduce emissions ahead of federal regulations. Some companies have been using “reduced emission completions” technologies – also called “green completions” – and processes for a decade or more to capture natural gas that used to be vented or flared when wells were completed and commissioned – processes that are now required by EPA on all new oil and gas wells. Green completions have been Devon's standard practice in the Barnett Shale since 2004. The company uses the same process to complete wells in New Mexico, Wyoming, Oklahoma and South Texas. Green completions take place during the clean-up stage of the completion, after a well has been hydraulically fractured. The clean-up involves removing the water necessary to fracture the well. During this flow back, natural gas is produced with the water. What makes the well completion “green," or environmentally friendly, is that the gas is separated from the water and placed in a pipeline instead of being released to the atmosphere. First, a sand separator filters out any sand, sending it through a 2-inch pipe into the disposal tank. That filtering leaves a mixture of natural gas and water. The second piece of equipment separates the water, which then reunites with the sand in the disposal tank. The gas, meanwhile, is diverted into a separate pipe and eventually is sent by pipeline to a processing plant. Another example of technology reducing emissions is industry’s voluntary replacement of high-bleed, gas-driven pneumatic controllers (used to manage the operation of mechanical devices, such as valves, at the production site) with either lower-emitting gas or electric controllers. It’s an example of a free-market approach to emissions solutions, where the motivation to maximize natural gas delivery to customers stimulates innovative process changes that also benefit the environment. Long before EPA’s recent regulations, oil and natural gas companies participated in EPA’s voluntary Natural Gas STAR Program, under which companies collaborated with the agency to evaluate methane emission reduction opportunities, implement methane production projects where feasible and provide annual reports to the agency on emissions reductions progress. Oil and natural gas companies are working with academic institutions and nongovernmental organizations across the country to monitor methane emissions and identify ways to reduce them. A number of companies participated in two recent high-profile studies conducted by university researchers in collaboration with the Environmental Defense Fund. One, by a team from the University of Texas, checked two sources of methane emissions in natural gas production and found emissions represented just 0.38 percent of production and were lower than a previous estimate by the same research team. Participants included Anadarko Petroleum Corporation, BG Group PLC, Chevron, ConocoPhillips, Encana Oil & Gas (USA) Inc., Pioneer Natural Resources Company, SWEPI LP (Shell), Statoil, Southwestern Energy and XTO Energy, a subsidiary of ExxonMobil. A second study, led by Colorado State University researchers, examined facilities that collect natural gas from production, remove impurities and ship it via pipelines and found that methane containment at the facilities was more than 99 percent. Industry participants included Dominion, Dow Chemical, Enable Gas Transmission, LLC (formerly CenterPoint Energy Gas Transmission Company, LLC), Interstate Natural Gas Association of America (INGAA), Kinder Morgan, Columbia Pipeline Group (formerly NiSource), TransCanada and The Williams Companies. Put together, these industry efforts and partnerships illustrate how oil and natural gas companies are advancing the work of reducing methane emissions, working with regulatory agencies, nongovernmental organizations and academic institutions. It’s work that’s ongoing and is driving technical innovation within the industry to help improve air quality in America.